Do your kids enjoy helping out in the kitchen? The Lil Divas, especially my youngest, love helping me cook. They have even started making me and their Dad breakfast a few times - a bagel, some fruit and orange juice! Seriously, isn't that just heart melting? It gets me every time they do it. 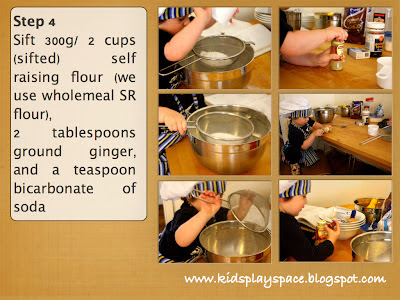 It makes me so proud that they are learning their way around the kitchen and that they enjoy it. 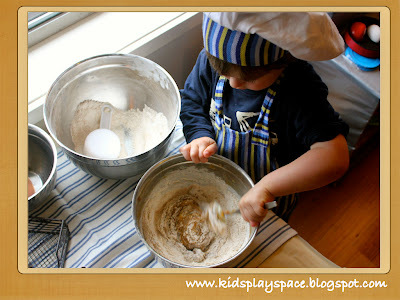 There is so much to learn through cooking - practical life skills, math, science, fine motor and more. I like to try and find easy things that the Lil Divas can assist in making. Desserts are one of our favorite things to whip up together. Today, I am super excited to introduce you to Anna of Kids' Play Space. She has one of the cutest kitchen helpers around - her son. 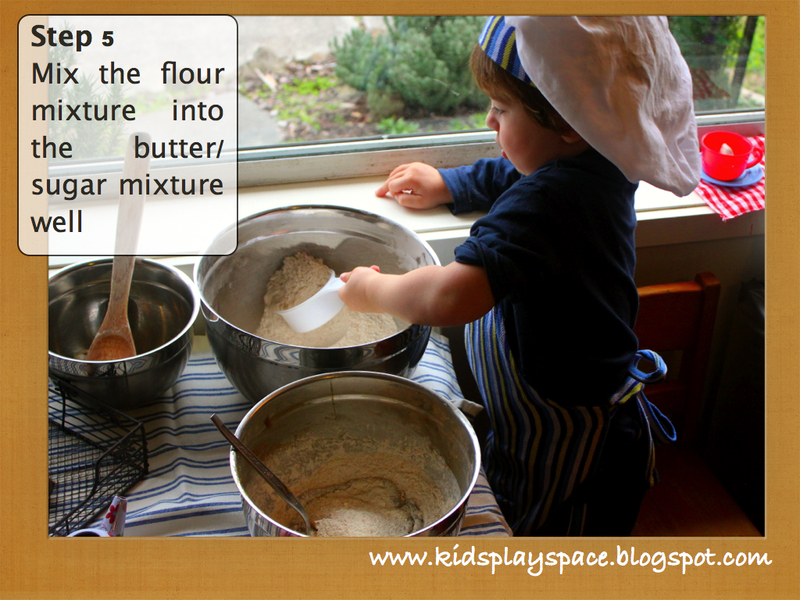 They have a wonderful time in the kitchen together. 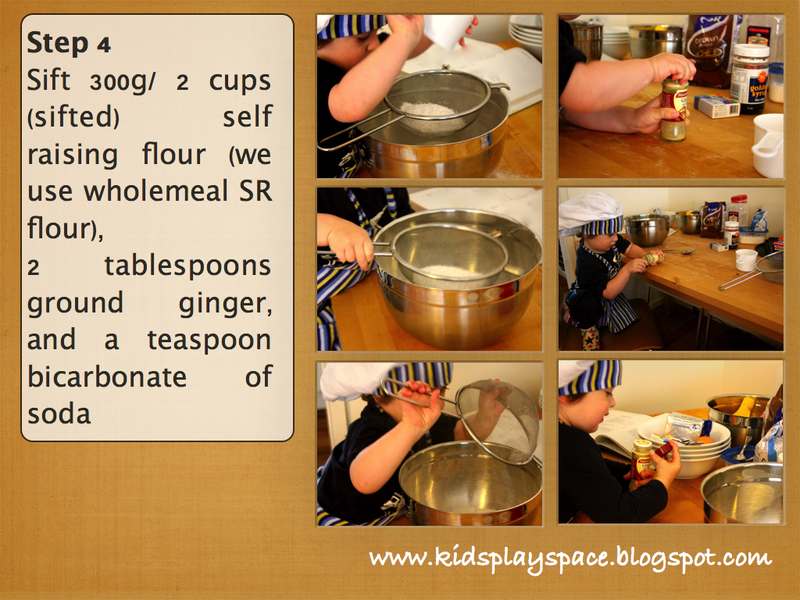 Now I will turn things over to Anna as she shares an easy recipe to make with kids - Ginger Cookies. Our 2 year old boy absolutely LOVES cooking and there were so many opportunities for him to get involved in this simple little ginger cookie activity! 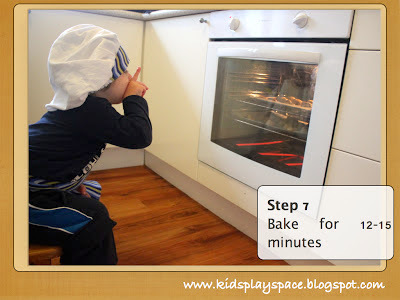 Although the recipe itself is beautifully simple to whip up - we had so much fun enjoying each step along the way, and before we knew it we'd stretched it out into a full morning's entertainment! 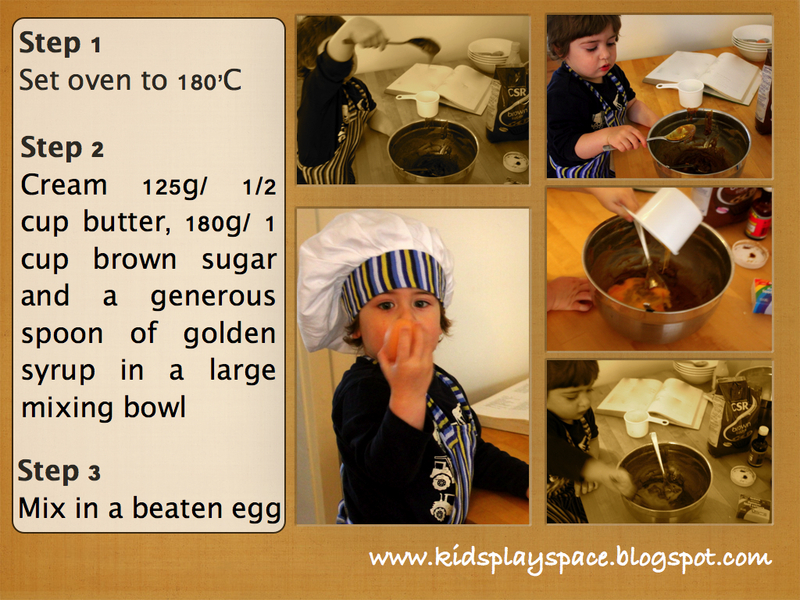 * Smelling the delicious mixture of butter and brown sugar! * Stirring (and holding the bowl stable with the other hand), rolling the dough between both hands- more important bilateral coordination skills ... the latter is still very much a work in progress!! * Waiting patiently and in total amazement while they bake - watching how they grow bigger with the oven heat! * Enjoying the special treat of tasting warm, freshly baked cookies! Yum! 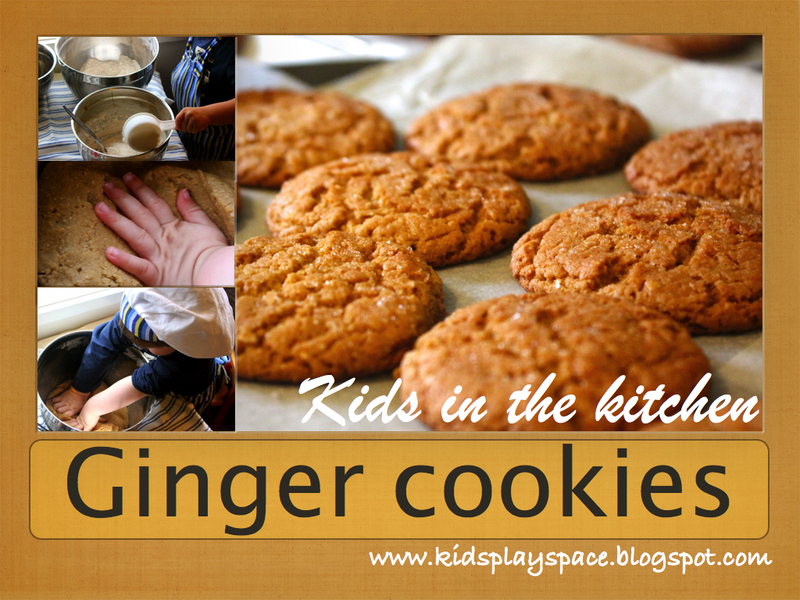 Now you get to enjoy those delicious cookies you baked together. 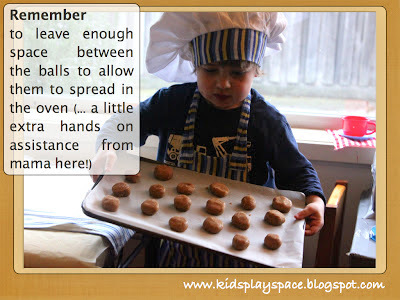 Some of our other absolute favorite Kids' Play Space 'kids in the kitchen' recipes include Blueberry Scones and Banana Blueberry Pancakes. I really hope you enjoyed this post. Anna is an occupational therapist and first time mum. After enjoying 2 wonderful years as a stay at home mama with her gorgeous little boy, she is now juggling both part time occupational therapy community work and family life. Author of the blog Kids' Play Space - a mother's journey, Anna is passionate about creating fun, simple, cheap, sustainable, nurturing play spaces, accessible to all children and easy enough for any parent/carer to set up! (No art degrees required!) 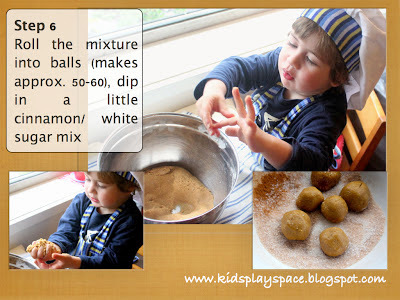 Follow along and join in the fun at www.kidsplayspace.blogspot.com, Facebook and Pinterest.